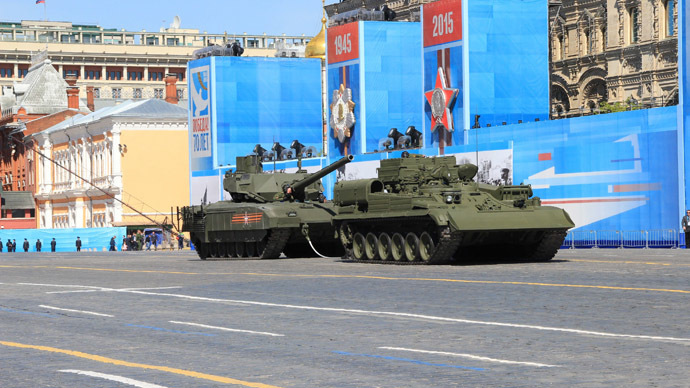 Russia’s military will be glad it was only a dress rehearsal, as its new state-of-the-art tank broke down in the Red Square. One of the T-14 Armata tanks ground to a halt, before finally rumbling away after the Victory Day parade rehearsal was over. In a dress rehearsal for the 70th anniversary of the end of World War II on May 9, a parade of the new tanks, which were getting their first public viewing, rolled towards the very heart of the Russian capital. All seemed to be going to plan until one of the mighty machines unexpectedly stopped right in front of the Lenin's mausoleum. Its engine was still running, but the tank would not move. An attempt to tow it away failed, before the T-14 eventually managed to restart and rumble off around 15 minutes later. The announcer of the parade said it was a ‘planned’ event. “We wanted to show how an evacuation of a tank would take place. It was planned that the tank would stop,” he said. The Armata’s main advantage over similar existing technology lies in its unmanned turret, controlled remotely from an isolated armored capsule. The latest tank has a state-of-the-art radar system that can simultaneously track up to 40 ground and 25 air targets within a 60-mile (100km) radius. The tank contains a new 125mm smoothbore cannon, which is the most powerful gun of its kind to date in terms of muzzle energy. It also needs just two people to operate it and there are hopes that it could have the potential to evolve into a fully robotic battle vehicle.